love, ink: Tag, you're it! Okay, so what do I have to do? Go to the 6th picture in my computer, post it and write about it..
Hm.. better make sure I'm in my "clean files" LOL j/k. Okay, so now the story behind the picture. 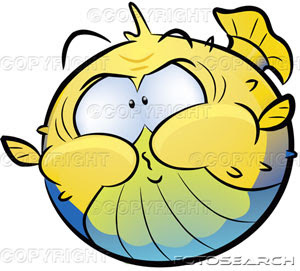 I was looking online for images of puffer fish - and saving them - well, I ended up finding a puffer fish image from Rubbernecker, so didn't have to try and draw one myself. But the fish are still on my computer. hmm... not as interesting, but there it is! He's cute eh? I can't remember what site this came from, but just google images of puffer fish & I'm sure you'd find him! So, now its my turn to tag........you're it!! Cool way to play tag! What a fun idea. Hmmm, wonder what mine will be. Karen, you know you're playing with fire here....LOL!! This image is too dang cute!! !